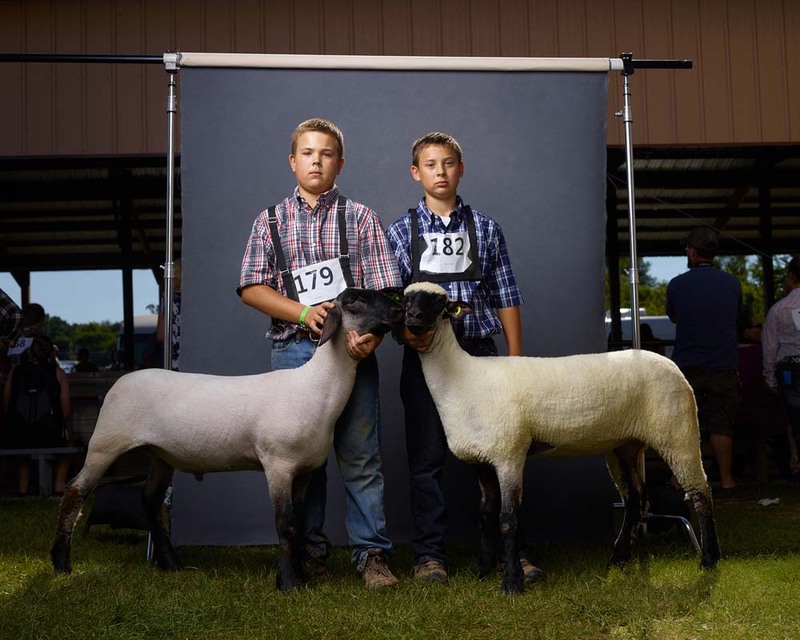 "Kenzi and Hootie, Anoka County Fair"
"Louis and Dumb, Freeborn County Fair"
"Tait and Evie, Anoka County Fair"
"Gus and Doolittle, Mahnomen County Fair"
"Kol and Annabell, Anoka County Fair"
"Bryce with Freaky Freddy and Nathan with Skittles, Isanti County Fair"
The Unchosen Ones takes place on the sidelines of county fair animal contests in Minnesota in 2016. One isn’t born a winner or loser, but a chooser. This is the theme I explore in this series. As we look at them, they look back, allowing us to think about how we choose winners and the repercussions for the ones not chosen. 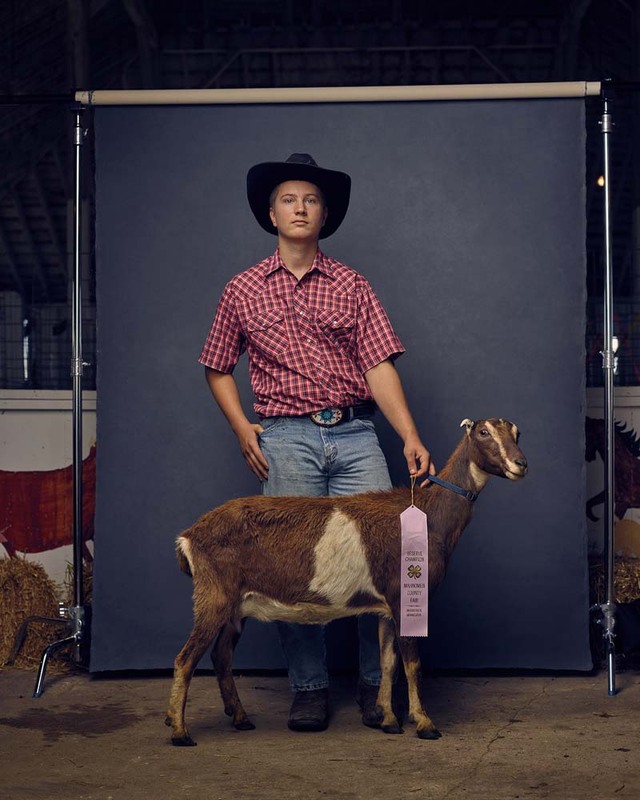 The project consists of over 60 portraits made at 10 Minnesota county fairs in 2016. 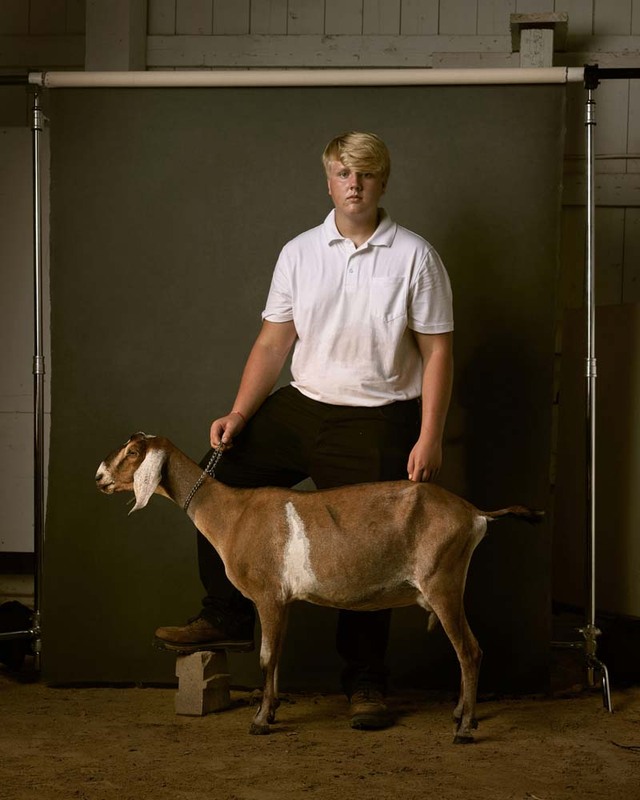 The photographs showcase the subject facing the camera, allowing the viewer to decide what connects and distinguishes these subjects. The memory of my cousin Janet and her Comandante Filomena portrait haunted me as I looked at my father’s archive. Like a medical examiner or forensic anthropologist, I examined X-ray after X-ray. They all seemed anonymous, as documents signed with an X. But I began to see landscapes, graven by our lives. X post facto is an emotional register for my experience during and after the Salvadoran civil war. Documents turned into metaphor, images become relics, traces, signposts. They mediate a site where we might explore the territory of our shared history. Recorded in the flesh. "The Sea in the Darkness Calls" is a travelogue along the coast of a Florida psychically charged by the shadow of irreversible climate change. In 2015, following the discovery that the decline of the West Antarctic Ice Sheet (WAIS) had “reached the point of no return,” I traveled with a 4x5 camera beside Florida’s coastline to survey how Florida had been changed by its own inescapable future. In a state where three-quarters of Florida’s 18 million residents live within coastal counties, how does life continue, let alone thrive, in an environment whose future has been so gravely foretold? I enjoy portfolio reviews because they always remind me of how vital photography continues to be as a form of expression, despite the ever-present rumblings of the medium’s imminent demise. The some 500 artists who participated in this process demonstrated vividly how necessary, and even urgent, photography can be, and how many new ways there are to see through the lens (and sometimes even without it). These artists escorted me across the globe and invited me in to their most intimate thoughts, sharing their unique perspectives and imaginative approaches. I was struck, as I always am, by the enormous breadth of subjects photographers choose, and yet not surprised to see certain themes emerge this year. Politics was very much on people’s minds, and though I did not choose any of the election-themed projects, I was moved by the sensitivity and nuance brought to the consideration of this fraught topic. Perhaps unrelatedly, the many deeply personal explorations of death, dying, and the overall fragility of life were given new resonance when seen against the background of the current geo-political situation. And then there were the goats. 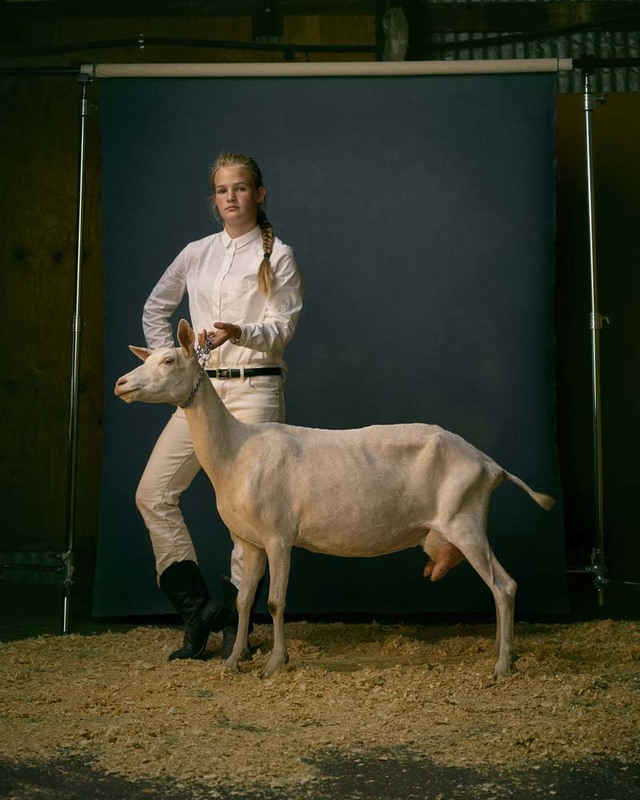 I cannot explain the abundance of goats in this year’s crop of submissions, but they were definitely there. The winners I chose are as different from one another as they can be, but I found them all deeply moving in their own way, and I’m pleased to be able to pay tribute to the variety of photography’s forms. 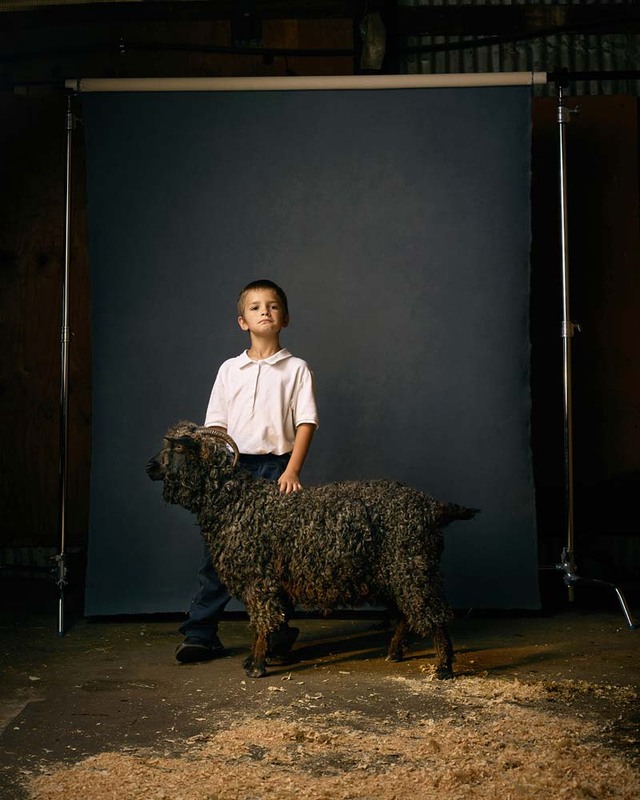 I chose R.J. Kern as the first place winner, a series of posed portraits of children and their non-prize-winning goats. The question of what it means to be a victor certainly had new resonance this year, but for me the issues of winning or losing were far less pressing than the sensitivity of the portraits, both of the children and of the animals (two subjects notoriously difficult to photograph) and most essentially of their relationship to one another. The simple conceit of a uniform backdrop called attention to the act of photographing and also highlighted the differences in scale, attitude, and pose among the sitters, both human and hircine. I found the project beautifully seen and surprisingly tender. My second-place winner is Muriel Hasbun who uses found photographs rather than making new images. The project uses dental x-rays she culled from her dentist father’s archive, which serve both as a metaphor for the ineffable horror of the civil war in El Salvador as well as a powerful witness to lives lived. The transparency of the X-rays lends a graphic and even visceral clarity to the way life has left painful traces on people’s bodies: cavities have been filled, or teeth are broken or replaced by implants. Just as teeth are metonyms for human bodies, so the photographs stand in for the absent subjects. In third place is Bryan Thomas for his photographs made along the Florida coast. Florida occupies an unusual place in the American imagination, at once the locus of intense political scrutiny and a site onto which cultural fantasies of race, class, and leisure are projected. Bounded by water on three sides, it is also a symbol of our current precarious environmental state. I appreciated the directness of these pictures, and the way they told stories without resorting to stereotype. I thought the series’s title, “The Sea in the Darkness Calls,” drawn from a mournful poem by Longfellow about the inevitable march of time, perfectly evoked the mood of the pictures.